@hmseen We get to see him in two movies in 2018! Yey! But I am so with you Need Hyun Bin drama! Maybe one drama. in 2018 as well?! Hello dramagods! who knows they might be checking Soompi. for sure. I'll be checking this movie... not in theaters but once it's sub. Thanks Go Seung Ji for update. The trailer gives viewers a jolt right from the start, as Hyun Bin appears to play Russian roulette with a bloodied and restrained hostage. 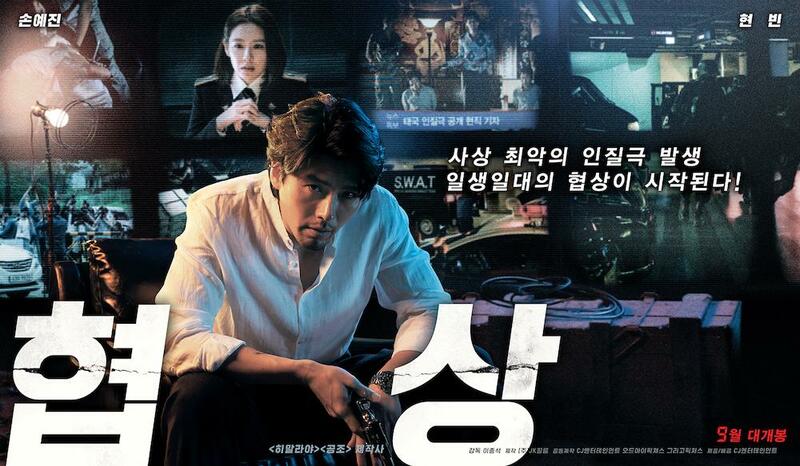 Hyun Bin is the film’s villain Min Tae Gu, who orchestrates a huge hostage situation in Bangkok, Thailand. Called in to deal is Ha Chae Yoon, played by Son Ye Jin, the best crisis negotiator there is, and what ensues is an intense ride of mind games, in Ha Chae Yoon’s race against time to save the hostages that Min Tae Gu has threatened to kill one-by-one. This is the first time that Son Ye Jin and Hyun Bin have worked together, and that, coupled with the sharp characters the two actors are inhabiting, has anticipations running high for this film. You'll also find some English translation for Press conference if you click on this IG's owner. Son Ye Jin-Hyun Bin Vogue September Issue for the movie "Negotiation"
Are you ready to 'Negotiate' on September 19th?